The secret fat-loss club you're going to want to be part of! Looking for fitness and nutrition so simple, it works... for life? You’ve got it! A fitness lifestyle resource by women, for women, which will become your best-kept secret! 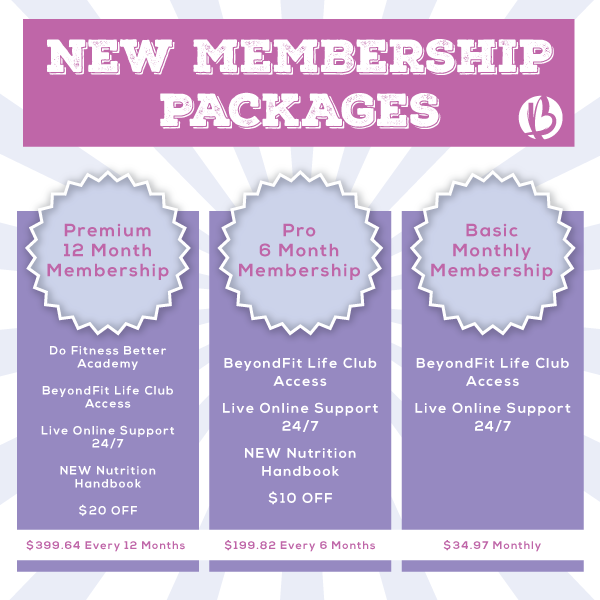 Are you NEW to BeyondFit Life? Welcome. I’m happy you’re here! Join us now and get INSTANT access to a full month of FAT-BURNING workouts, SIMPLE recipes and SECRETS from inside the fitness industry. Ever wondered where all the top fitness tips, quick-glance food lists, fat-loss recipes and metabolism-boosting workouts are kept? You’ve found them! They’re all here – at BeyondFit Life. Fat-loss doesn’t’ have to be a puzzle. Are you ready to crack the code and piece together your own personal blueprint which you can use again and again? That’s a BeyondFit Life! What do BeyondFit Life members receive? Join and start downloading your workouts and recipes now! And unlock dozens of fat-loss BONUSES which will transform your fitness and nutrition! The BeyondFit Life member site is a goldmine of information: everything you need to succeed with fat-loss, training and smart nutrition. Discover the tips and tricks which make up that elusive final 10% which will take you beyond traditional training and nutrition. 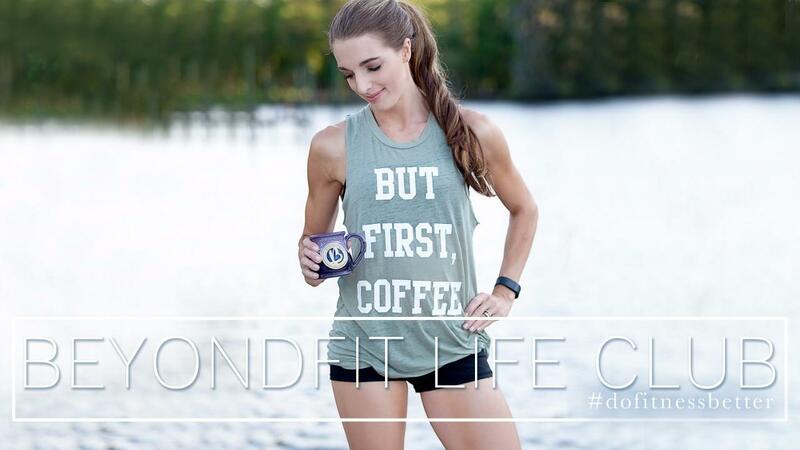 I’m Kate Horney, founder and creator of BeyondFit Life. This is my (other) baby, but it’s not a solo effort. It’s a network of 1,000s of women worldwide. And that’s where the unique strength and value of BeyondFit Life lies. You already know how amazing we are when they get together. Imagine the collective strength of a community of smart, focused, determined women from across the world. But wait, you don’t need to imagine it – be part of it! It’s exactly what you’ll find at BeyondFit Life. The BeyondFit Life community, supported and guided by me, is a formidable resource. Body fat really doesn’t stand a chance up against our professional knowledge, experience and accountability. Join the BeyondFit Food along with BeyondFit Life Club! I know how hard it can be to plan your meals as a busy woman! I wanted to provide everything you need for meal planning in one nice package. This is where BeyondFit Food comes in. BeyondFit Food provides a simple, structured nutrition plan. Plan meals, discover delicious healthy recipes and automate your grocery list. There’s a popular saying in the fitness industry, that you can’t out train a bad diet! The truth is that 70% of your fat loss results come from FOOD, with 30% your fitness routine. It’s no wonder BeyondFit Life members succeed in their fat-loss journeys. It’s hard to see how any one of us could fail! We’ve all got each other’s backs, 24/7, all year round. Access DOWNLOADABLE resources, find support on the online FORUMS and UNCOVER the answers you’ve been looking for regarding fat-burning, workouts, nutrition and living the lean lifestyle. 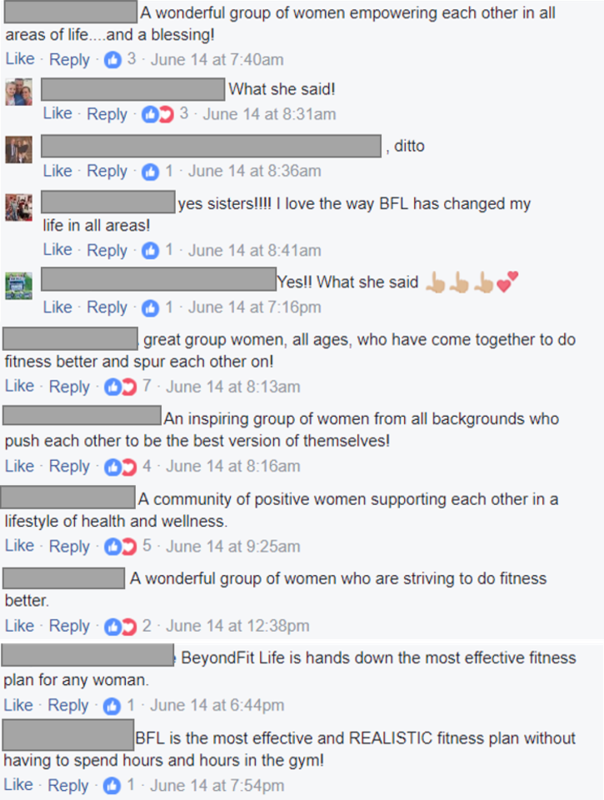 The BeyondFit Life forums are private, welcoming and busy with discussions from women just like you: moms with new babies, women busy with young families, executives with stressful jobs and everything else life throws at us! Together we make a great support network, and together, we get results! Join now, and discover how to participate in exclusive Transformation Challenges, unlock hundreds of fat loss articles you won’t read anywhere else, download fat loss tools, expert interviews, bonus “How To” exercise videos, meal plans, recipes and more! Join BeyondFit Life now – and immediately gain access to everything you need to transform your body in a matter of weeks! Tackle your body’s troublesome HOT SPOTS now… and for good! As a new mom, a business owner and a busy family-oriented woman, I know that endless hours in the gym and eating nothing but chicken and veggies just isn’t going to work for real women and real fat-loss! I figured out the exact formula which guarantees energy, health and fat-loss for busy women living real lives! Want to hear it? Of course you do! I know that’s what you’ve been looking for – that’s why you’re here, right? READY TO GET IN THE ACTION? Register and join 10,000+ other moms worldwide on the quest to banish muffin tops, thunder thighs and jello arms once & for all!